In 1966, Michael Sullivan (1916-2013) was appointed Professor of Chinese Art at Stanford University and moved to California with Khoan (1919-2003). They met the artist Zhang Daqian (1899-1983) there many times, as he started to develop his career in America. In 1969 he also moved to California. This painting is among the splashed ink-and-colour landscapes that Zhang Daqian produced from the 1960s. The inscription reads ‘Spring snow on steams and mountains. 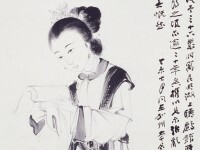 The old man Yuan.’ The painting was first exhibited in the Laky Gallery where Khoan admired it. Mr Laky told Khoan that the painting was very expensive but he might get it from the artist at a lower price. Khoan urged Mr Laky not to speak to Zhang about it, as Zhang would be very angry if he knew that a friend was trying to purchase one of his paintings. But evidently Laky told Zhang after all, and on the day Zhang left to return to Taipei, this painting arrived, beautifully framed, as a gift to Khoan from the artist. Zhang wrote a letter to Khoan to accompany this painting, and it is also on display in this exhibition [LI2022.37].